Lipscomb is 25-7 but just lost their conference tournament and automatic tournament slot to Liberty, so they could be competing with us for an at-large berth. Literally nothing went our way today. Which, honestly, is fitting for this season. Yep. That 82% went to about 10% at best after today. Unreal. Eff this season. Even after Oregon's win over Washington, Lunardi still has us in the field. This feels like a coin toss, and what could ever go wrong leaving our fate in the hands of a selection committee? Would be an upset at this point not to make it. Would take a groupthink blind spot or a committee bias bracket watchers aren’t aware of not to make it. When do they announce brackets? tonight after the last championships or tomorrow? Also do any of these predictors know how the new ranking system the committee uses is going to work or are they basing everything off the past systems? disclaimer: I know just enough about March Madness to ask questions without really knowing what is a good question. Good to know - 5 pm. Wasn't expecting it to be on CBS, I may watch part of it. As far as most things committee based, I just watch with little expectations in either direction. Two years ago, the NIT felt like an exciting step forward. Today, it feels like a bitter disappointment. This team really struggled with a lack of warm bodies at the end of the year. Would've been nice not to have so many players flat-out quit on their teammates halfway through the year. None of the bubble teams really deserved it. Quite frankly first four never really feels like the tourney. Prob a 50-50 chance you don’t even feel like you even made the tourney. Would still rather be in that position but a #1 NiIT seed with a chance to play several games has potential to be a positive. Play-in game win and get annihilated in the second game versus a deep run and maybe a banner in MSG? Yeah, not crying in my beer tonight, but I'm sure the boys are disappointed. Onward...GO FROGS! I had season tickets this year. Can I get these same seats for the NIT? Which, in and of itself, is a sign of major progress in the program. Just 4 short years ago, regular attendance at any post-season tournament seemed a goal too far to reach. We were in 167 of 180 final bracket guesses. Bubble teams all look somewhat alike, but the pundits really missed on us. The other thing is that UNC greensboro was the first team out. Between them and Belmont, it is clear that this committee valued the mid-major resumes more than the pundits. 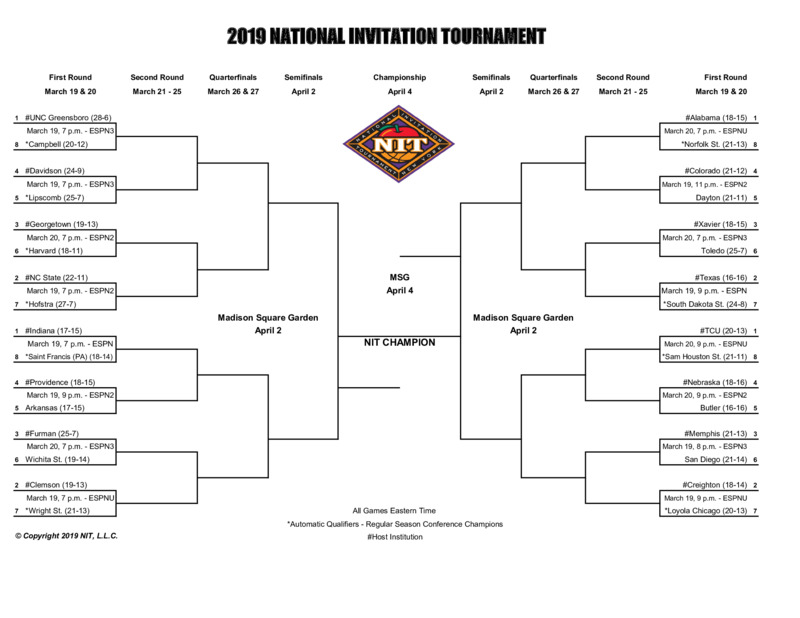 Which, in and of itself, is an indication of me not expecting us to do well in this NIT. Two years ago, we were really excited to just make the NIT and wanted to do well very badly. Now, I expect the guys to be disappointed and not all that into it. It'll be a challenge for Dixon to get us ready to play.